I can’t think of a more fitting way to mark the first day of autumn than to share with you some of my fall decor. 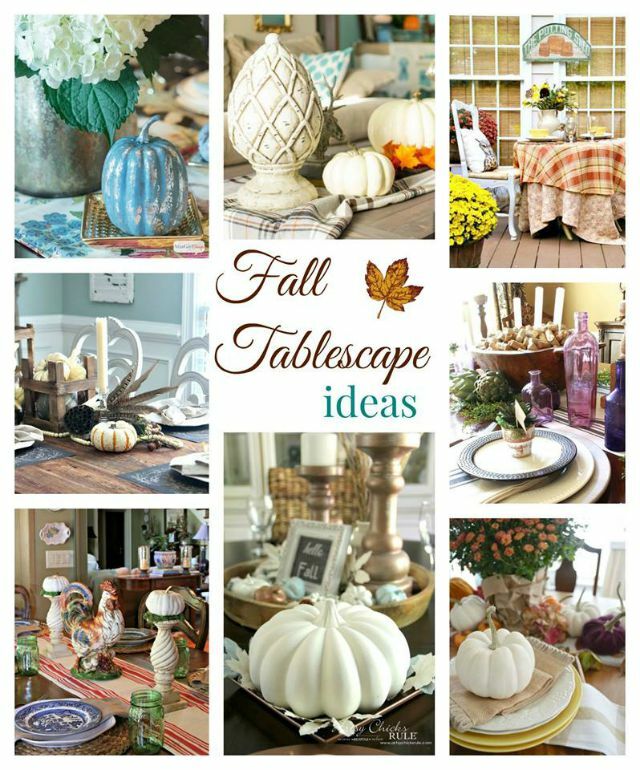 I’m thrilled be a part of the Fall Ideas Tour, organized by my friend, Kathy, of Petticoat Junktion. 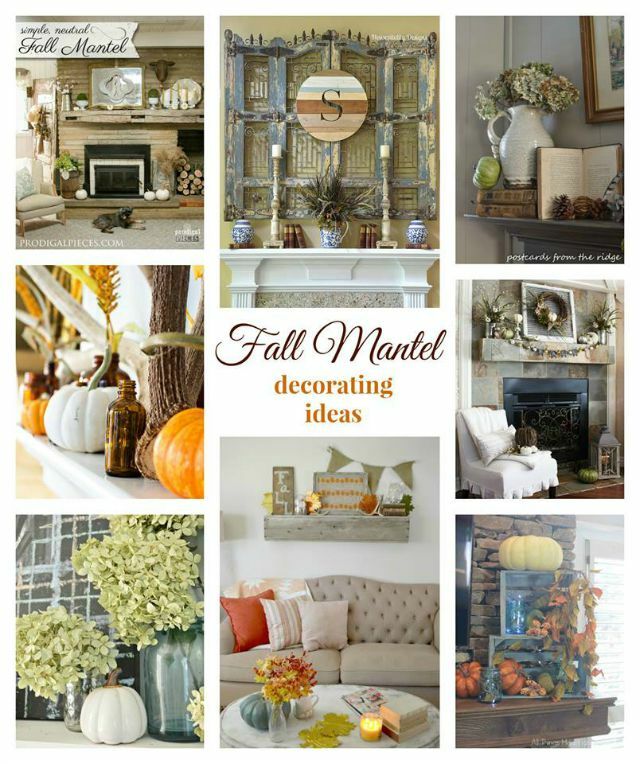 Four days, 32 bloggers, countless ideas for fall mantels, tablescapes, wreaths and thrifty crafts. 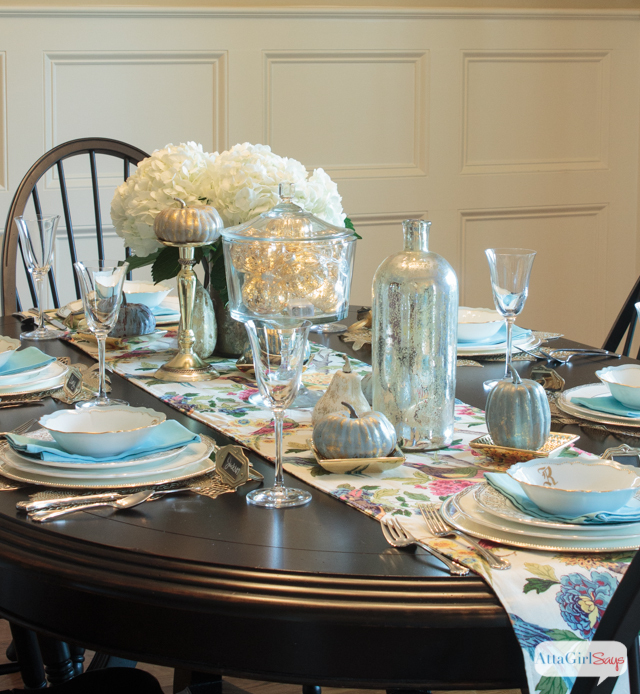 Today is Tablescape Tuesday, so I’ll be giving you a tour of our dining room, all done up for fall. 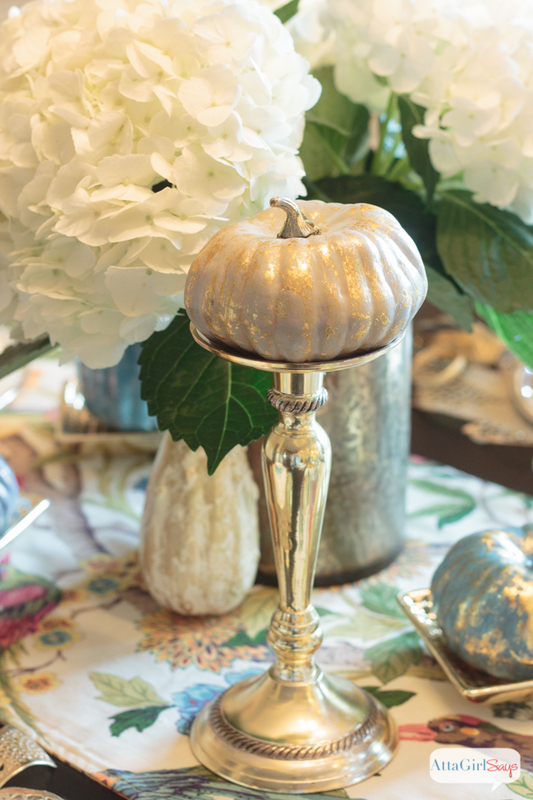 You can follow the links at the end of this post to check out all the other fall decorating ideas from my fellow bloggers. I’ve been veering away from tradition this year, combining colors like aqua, lavender and dusky green and decorating with metallics. 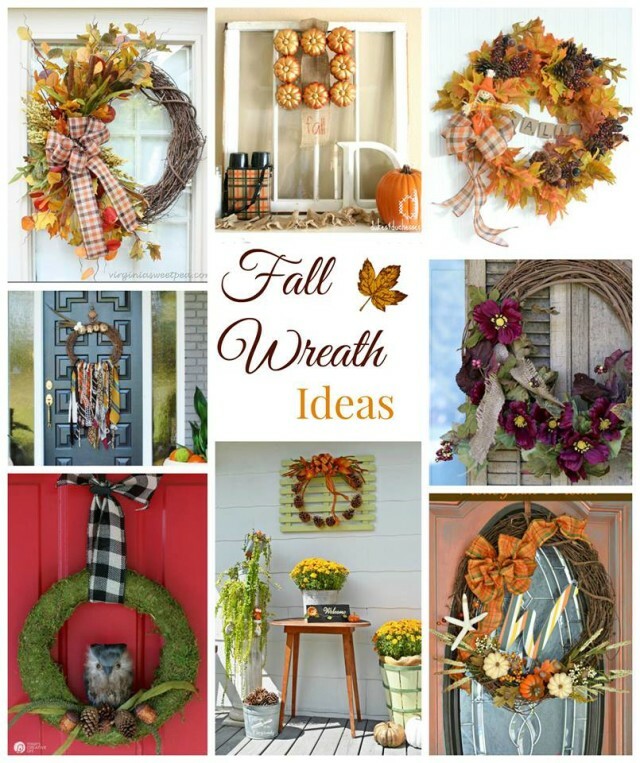 It all started with the fall wreath I made for my front door. I decided to bring the same theme and color scheme inside to the dining room. I’m a real glitz and glamour kind of gal — the more sparkle and shine the better. Mercury glass. Gilding. Crystal. Silver. I love it all. And even moreso when I can mix them all together. I used them all around the table, sitting them on gold plates from the dollar store, atop candlesticks and just scattered about. 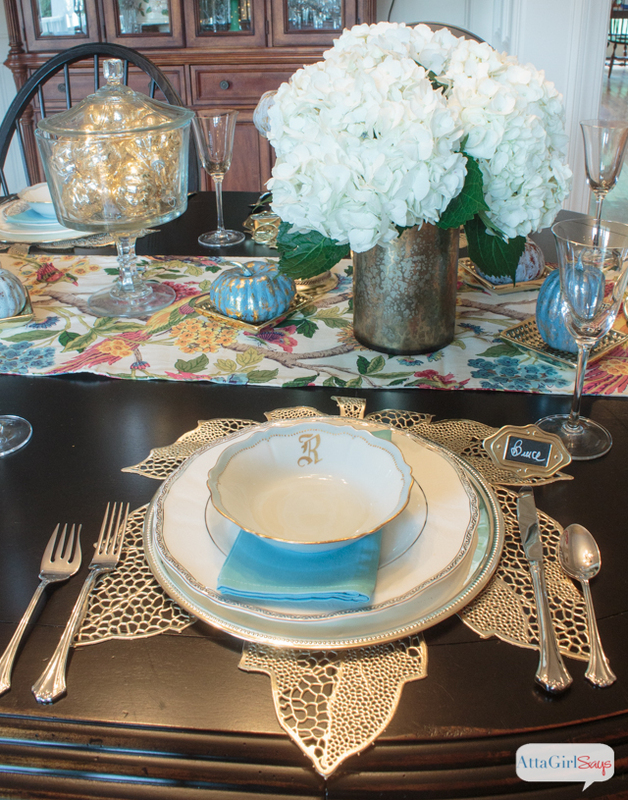 This tablescape looks fancy, but it was really easy to pull together because I gave myself license to mix and match. 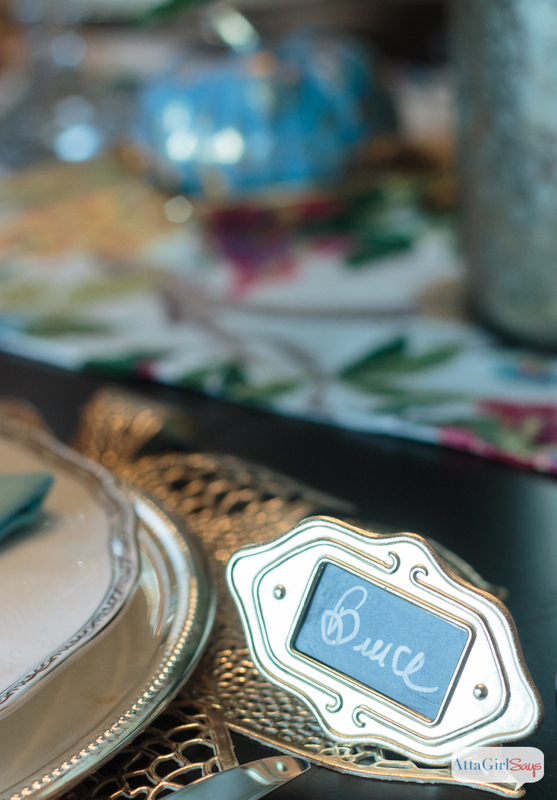 I rounded out each place setting with our everyday flatware and gold chalkboard place cards. For some extra glow, I filled a clear glass trifle bowl with a lighted mercury glass garland of pumpkins. I liked these battery-operated pumpkin garlands so much I bought two at Homegoods. 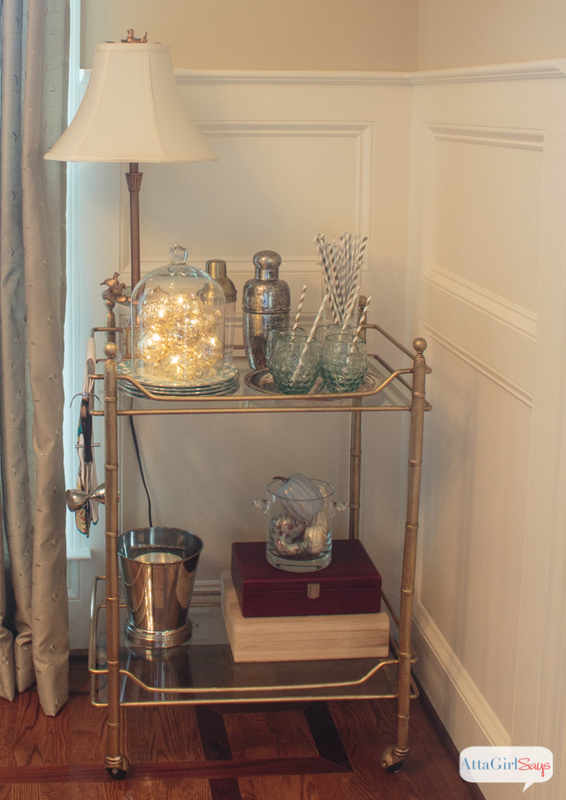 I put the second one under a cloche on the gilded bar cart. 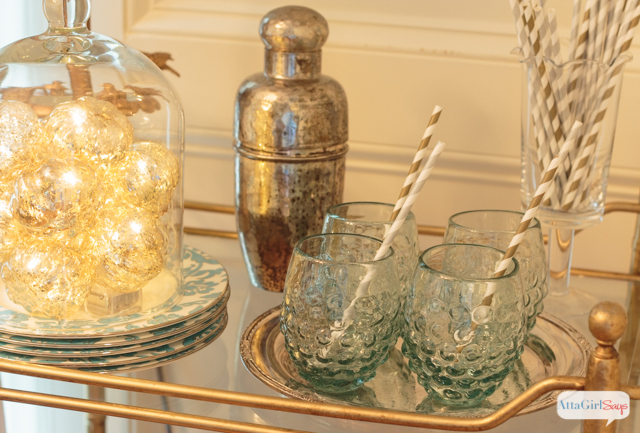 Gold and silver striped straws even match the color scheme. As much as I love decorating for the seasons, as we head into fall and the holiday season, I’m trying really trying to lessen the workload on myself. This year, I think the theme of my seasonal decorating will be really be focused on adding touches that work with my existing decor and color schemes. It’s way too much work to reinvent every room for fall, Halloween, Thanksgiving, and Christmas. By working with what I already have, it’s so much easier to decorate and undecorate. 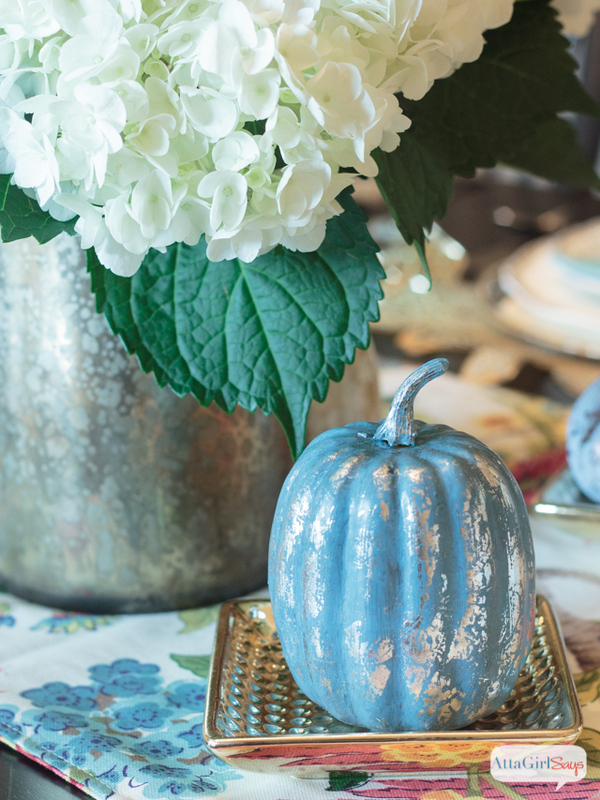 I can pull out a tablerunner that maches my china, drop a bouquet of showy white hydrangeas in a mercury glass vase and sprinkle the table with blue, gray, aqua and white pumpkins, and the decorating is done. It still looks and feels like fall, with nary a shade of orange in sight. Most importantly, it still looks like me and honors the things I love and have collected to reflect my decorating personality. For a glimpse at how others let their personality shine in their fall decor, be sure to visit the other participants in the Fall Ideas Tour. Amy, I love all the sparkle and shine in your fall dining room. Your china is gorgeous. Love the color and edging of those bowls. Ooh…you’re talkin’ now! I love metals and you’ve done a fantastic job of displaying them, Amy. Bravo! Oh my heavens – we love your table. The mixed metallics add such a lovely shimmer and shine. We are sure it is gorgeous by candlelight too! 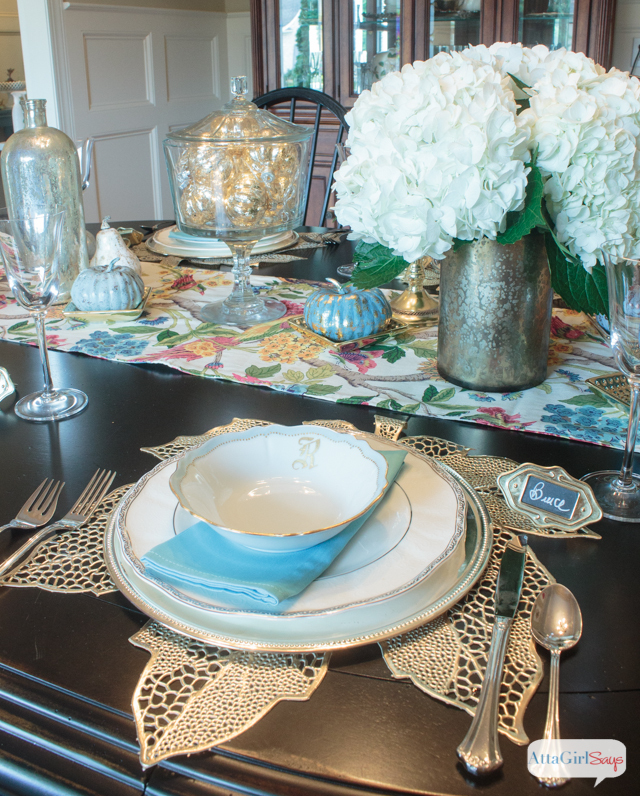 Love your china and place cards too! Can’t wait for the tutorial for those gilded pumpkins! The mixed metals is genius! It is so pretty all put together! I love the colors and the soft metallics, Amy! And I totally agree about making it in your own style and using things you love. Can’t wait to see how you did those painted pumpkins. 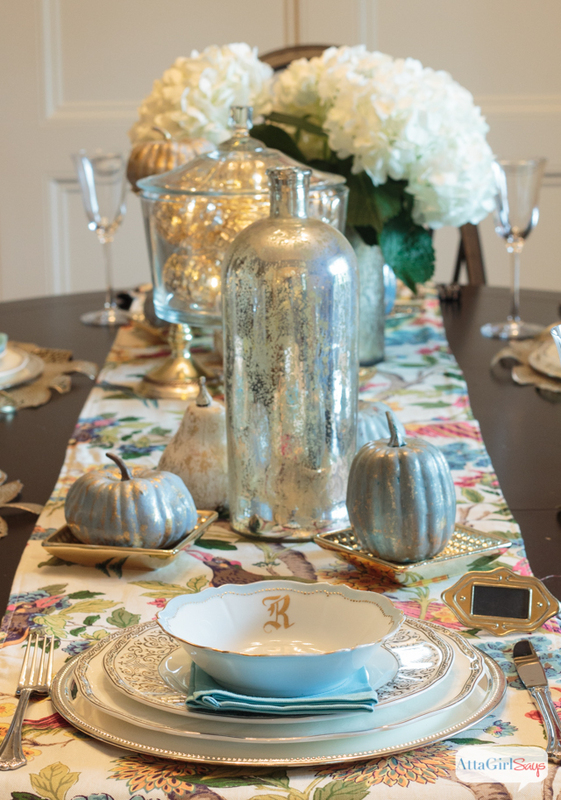 Oh my do I love all the glitz and glamour of your Fall Tablescape Amy – it is absolutely gorgeous! 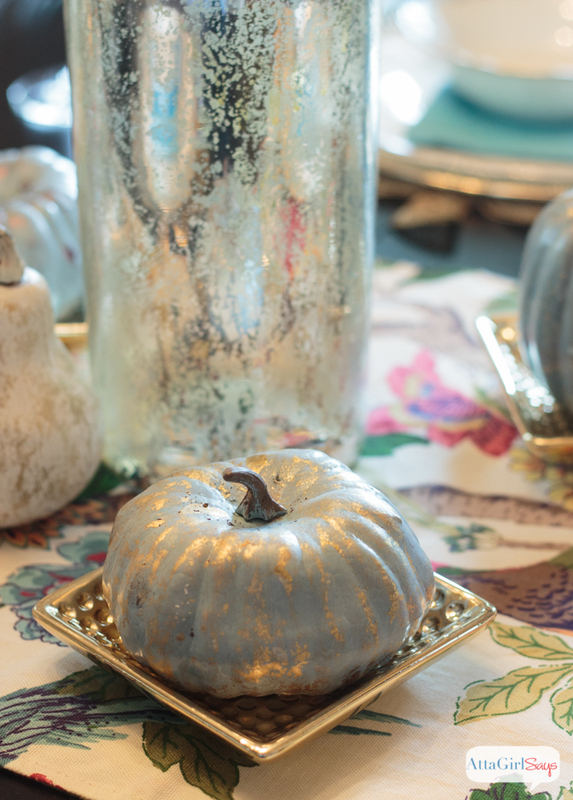 Love your idea of placing mercury glass pumpkin garland lights under glass – just adds to the glam. Beautiful Amy! I love the shimmer and I’m very jealous of those perfect hydrangeas, mine were trimmed (scalped) late in the spring and course the only thing that looks good are the leaves. Oh, I didn’t grow these Debbie. I bought them at the Fresh Market! The hydrangea I planted a few years ago failed to thrive even though the one at our last house grew like crazy with absolutely no tending! Wow, it’s just beautiful Amy. 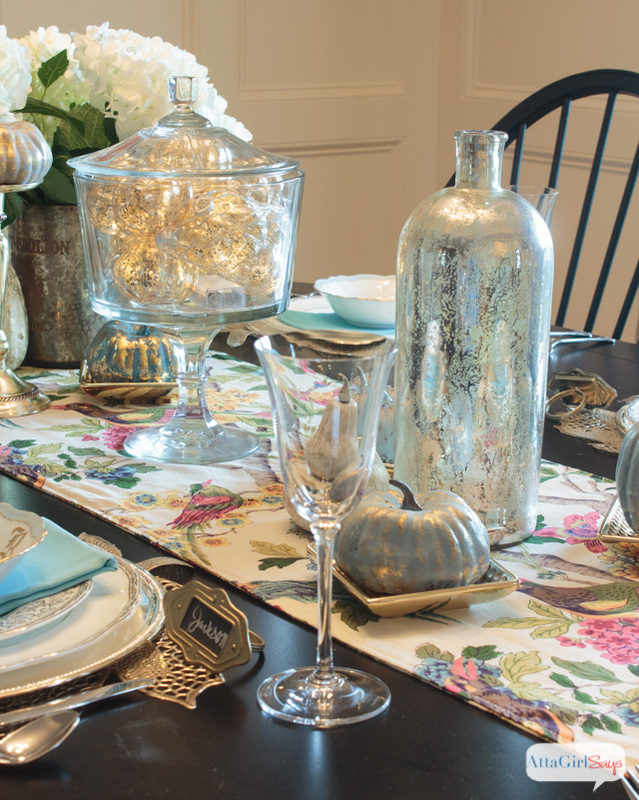 The mixed metals…that gorgeous table runner(I LOVE it)…truly stunning! So loving the beautiful colors of the metallics. Certainly great Fall Glam! !…and love the bar cart!!! I like this metallic look and that surprises me! I especially like the turquoise!! Beautiful, Amy! 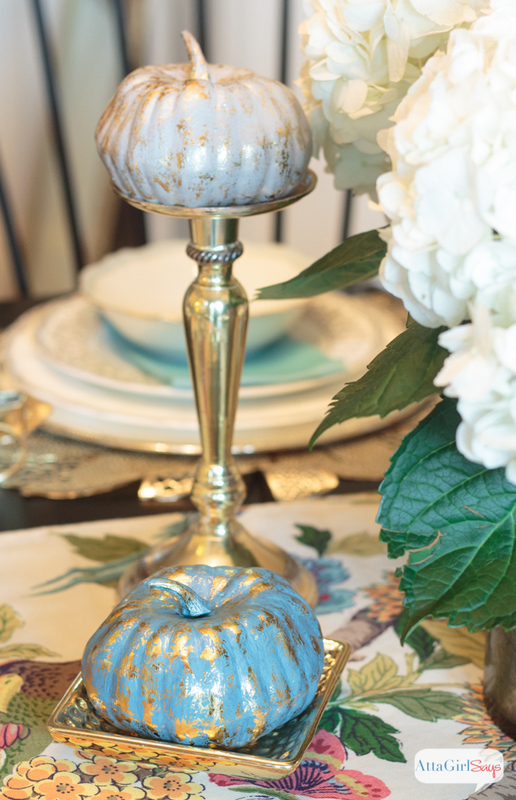 Metallics make a pretty table setting for fall. I love your dishes. Are they your wedding china? Amy, This is just so pretty! I love all of your elements, accents, and color. They work perfectly together. 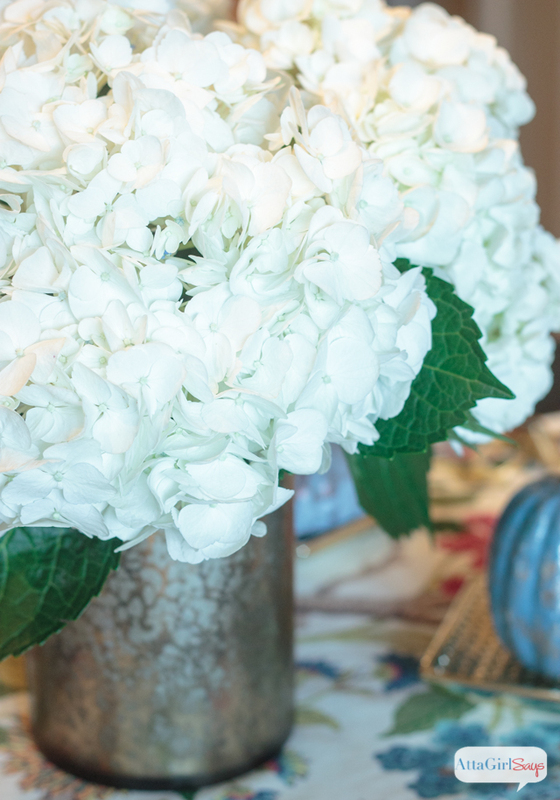 What a beautiful fall table you’ve set! Love all the nontraditional colored pumpkins, especially when they are beside those gorgeous snowy white hydrangeas! And I wouldn’t have been able to pass up those monogrammed bowls, either! 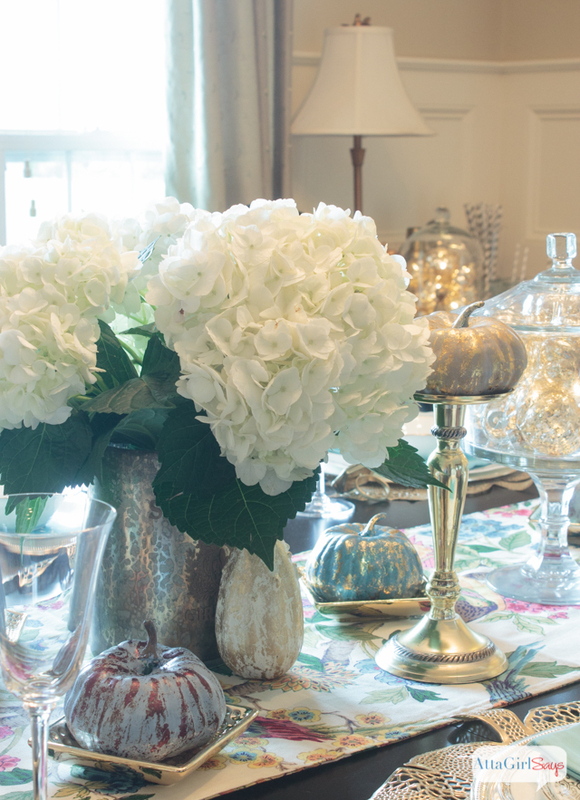 Amy – Your table is stunning and I love the metallic accents! Thank you for sharing this wonderful project at the Thursday Favorite Things Blog Hop! You are one of my features on Tuesday Treasures. Hope to see you again this week! I love all the details. And the bar cart. 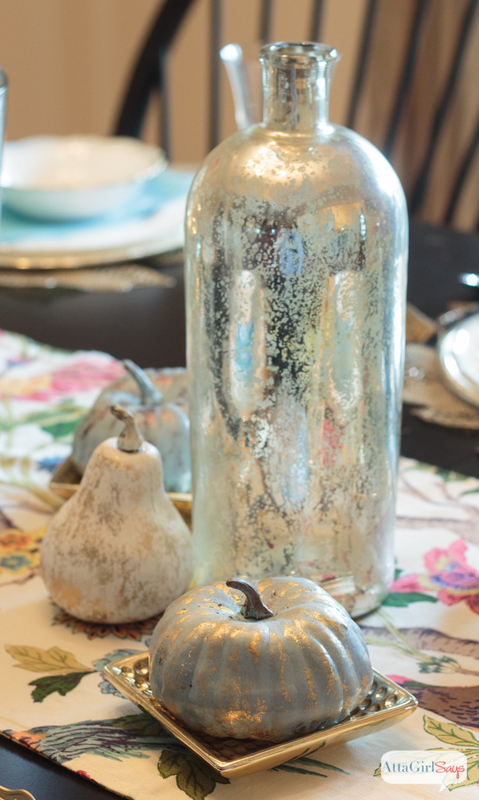 Thanks for sharing your lovely fall metallic decorating. Pinned & shared.